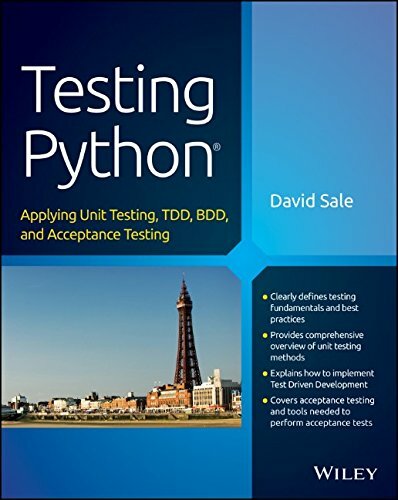 Testing Python; Applying Unit Testing, TDD, BDD and Acceptance Testing is the most comprehensive book available on testing for one of the top software programming languages in the world. Python is a natural choice for new and experienced developers, and this hands-on resource is a much needed guide to enterprise-level testing development methodologies. The book will show you why Unit Testing and TDD can lead to cleaner, more flexible programs. Unit Testing and Test-Driven Development (TDD) are increasingly must-have skills for software developers, no matter what language they work in. In enterprise settings, it's critical for developers to ensure they always have working code, and that's what makes testing methodologies so attractive. This book will teach you the most widely used testing strategies and will introduce to you to still others, covering performance testing, continuous testing, and more. Knowledge of software testing in Python could set you apart from Python developers using outmoded methodologies. Python is a natural fit for TDD and Testing Python is a must-read text for anyone who wants to develop expertise in Python programming.